Eurocom has expanded the storage capacity and custom options of the Panther line of Mobile Supercomputer Workstations with the addition of the highest storage density hard disk drive for mobile products. The 8 TB of RAID 0/1/5/10 total storage can be accomplished with four 2 TB Samsung Spinpoint M9T Hard Drives. Packing three 667 GB platters inside its 9.5 mm chassis, the Samsung Spinpoint M9T is the thinnest 2 TB drive on earth. “Eurocom understands that modern professionals are requiring larger and larger storage capacity, running heavy duty applications such as Autodesk and Solidworks, that is why we are now offering the 2 TB Samsung Spinpoint M9T to our clients, on top of high performance, high endurance enterprise level solid state storage options, such as Intel DC S3500 and DC S3700. At the same time there is a requirement for redundancy and performance so we offer through RAID 0/1/5/10 support.” Mark Bialic, Eurocom President. The EUROCOM Panther 5 Mobile Workstation and the 3D enabled Panther 5D mobile supercomputers are built to offer unmatched performance, long lifespan and full upgradeability of the processor, memory, storage, operating system and VGA technology, and are designed with the most innovative technology and components available, from workstation class desktop Xeon processors, RAID support to dual GPU capabilities and up to four SODIMM modules for 32 GB memory. Eurocom developed the Panther 5 to be a mobile powerhouse for simulation, ray trace rendering, mobile analytics, CAD, CAE and so much more; while being a long term, stable system. 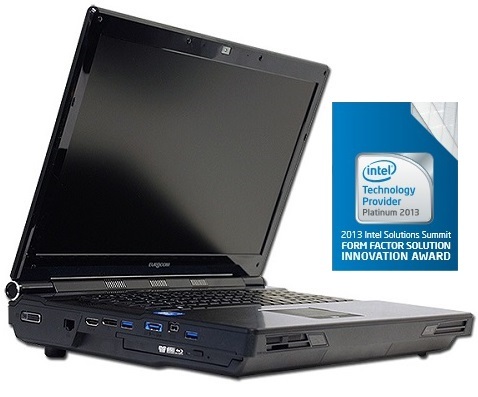 In recognition of this innovation the EUROCOM Panther 5 was awarded the Intel Solutions Summit Form Factor Solution Innovation award for packing the performance capabilities of a datacenter server into a portable form factor, complete with workstations tools such as keyboard and monitor. “We consider ourselves one of the most innovative North American companies as we dedicate ourselves to offering our customers, all over the world, the most advanced and capable, custom computer hardware on earth.” Mark Bialic, Eurocom President. Combined with Intel Xeon processors, up to Intel Xeon E5-2697 v2, with 12 cores, 24 threads, 30 MB of L3 cache, running at 2.7 GHz and 8 TB of high capacity SATA 6 Gb/s storage will offer Eurocom customers super computing capabilities on the go. Supporting the most powerful mobile professional graphics solutions including the NVIDIA Quadro K5100M, K41000M, K3100M, K2100M and K1100M in the EUROCOM Panther 5 ensures they are able to run the most demanding engineering and design software with ease, while on the go. Samsung Spinpoint M9T 2 TB drive ships with 32 MB DRAM cache, low acoustics and power requirements, which offers high performance, energy efficient operation for longer battery life in the Panther 5 Mobile Workstation. The M9T combines the highest areal density in a single storage device allowing it to fit into a 9.5 mm chassis and the EUROCOM Panther 5.